It’s been said that this year, the nightmare year of 2017, has been the best year for games in quite a long time. In the midst of violent and bewildering policies and decisions handed down from the executive branch of the United States Federal Government, many of us delved deep into The New Colossus, Destiny 2, Super Mario Odyssey, and a whole host of other expansive and intriguing videogames that seemed to push the medium’s narratives and design assumptions forward in fresh, new ways. Snuck in there, beneath all of the titans and behemoth’s of the industry, was a little game called Final Fantasy IX, a remaster of the original PlayStation game from year 2000, with a whole host of playability features, for the PS4. And it is the best game of 2017. The reasons for this are varied. I’m not sure that Final Fantasy IX was the best game the year that it came out. The PlayStation 2 was already out in the world and smoking up the streets with its Emotion Engine technology. It was plagued by incredibly long load times, and there were countable seconds between encountering an enemy, the battle screen loading up, and then the fight proper. Transitioning from area to area was an exercise in waiting. Paired with that, it was much more cartoony than Final Fantasy VII or Final Fantasy VIII, and definitely more lighthearted, and for whatever reason it receded into the depths of the minor entries in this long-running franchise. Those things are, of course, “fixed” in the newest remaster of the game. Load times are reduced, there are quality of life improvements like a High Speed Mode and a Max Damage mode for cheating your way through the bumpier parts of the game, and in general the whole thing looks less like a muddy mess when you stretch it out to the dimensions of a modern television screen. This isn’t why it’s the best game of 2017. These are merely reasons why it’s a good, necessary port for the PS4 console. It’s the best game of the year because the top-down design of the game does everything that games in 2017 wanted to. Final Fantasy IX is a game far, far ahead of its time when you consider the narrative plot threads, the way that narrative is communicated, and what the ultimate payoff for the world is. A princess runs away from her kingdom and is hunted by her evil mother who wants to sacrifice her in order to obtain weapons of mass destruction. An automaton considers his nature as a constructed being. The last knight of a ruined kingdom wanders the world in search of revenge. These are high concept ideas, and they’re all plot threads for the wide cast of characters that appear in the game. The classic problem of the narrative game is dealing with “off screen” content. How do you explain to a player that something happened to a character that they were not controlling? How do you give a sense of a world? Certain games solve this with a cutscene, or with exposition, or even sometimes a scrying pool. Final Fantasy IX gives us cutaway scenes, almost-cutscenes, were we see characters moving, acting and discussing things in the same locations that we’re playing in, but the player isn’t around. This is the NPC with an AI routine before that was possible, or the audio log before it was palatable. The world gets built out, and those narratives above get advanced, even if the player is doing nothing to make it happen. Games are continually, without fail, trying to achieve what this Final Fantasy game did in the year 2000. 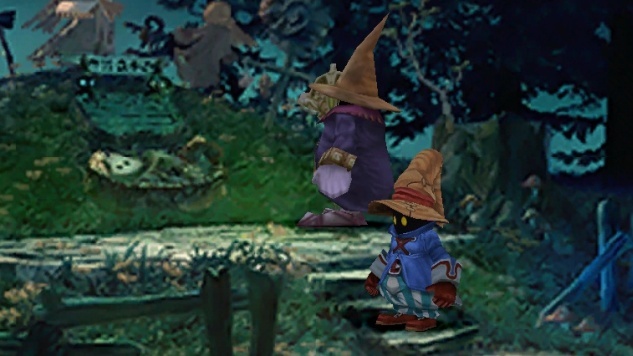 They are trying to convey heroic central plots surrounded by a living, breathing world, and FFIX achieved those two measures with a simple, efficient set of scripted narrative events that closed off narratives, opened new stories, and constantly recontextualized the actions of the player and NPCs. While those narrative interactions are happening at a micro, moment to moment, level, the quests and side quests are intertwining at the highest levels of the open-world game design that the game shifts over to on its last couple discs. A minigame of hot-and-cold spills over into solving a crisis in moogle mail transportation, which in turn develops into a plot that demands you go to all of the world’s beaches and soak up the waves. Auction houses owned by prime antagonists are used to acquire items which are then sold and lead to a path of getting a special sword in a secret city of knowledge. It is JRPG post-game content turned up a notch and fully integrated into the narrative and questing world that you’ve already spent 30+ hours in. The best game of any given year is a game that seizes on the highest ideals of what games can do and then executes on them, and this game from 17 years ago peers right into the grand problems of “big question” narratives, the development of a world, and total quest-side quest-narrative integration, and then deftly solves them all in elegant and efficient ways. It’s a game that does all of the things that we value games for today, and it deserves its place in the pantheon. It’s the best game of this 2017.